What Is a Whale's Diet? What Are the Dolphin's Body Parts? How Do Dolphins Survive in Their Natural Habitat? How Many Kinds of Dolphins Are There? While many aquariums and aquatic theme parks use cute dolphins as advertising hooks, it is often understated how fascinating and varied the dolphin family of mammals is. Dolphin species can be found in waters across the world, in both fresh and saltwater environments. Dolphins breathe air, perform live births, and use echolocation to find food and navigate through water. However, dolphins are not the only type of aquatic mammal that do this, making it hard to determine precisely how many types of dolphins exist. There are approximately 36 dolphin species known to humans today, found in fresh and saltwater environments across the planet Earth. Dolphins are a member of the marine mammal group known as cetaceans, which also contain whales and porpoises. Because of the many similarities between dolphins, whales and porpoises, in addition to the fact that 'dolphin' and 'porpoise' were once considered interchangeable terms, people have commonly been confused as to the precise number of dolphin species that exist. Visually, the various species of dolphin tend to be quite similar. They have streamlined bodies with blowholes, paired pectoral fins and usually a single dorsal fin; they swim by moving their flat tails up and down; they use teeth to eat a wide variety of fish, crustaceans, squid, and similar creatures; and many have defined beaks. 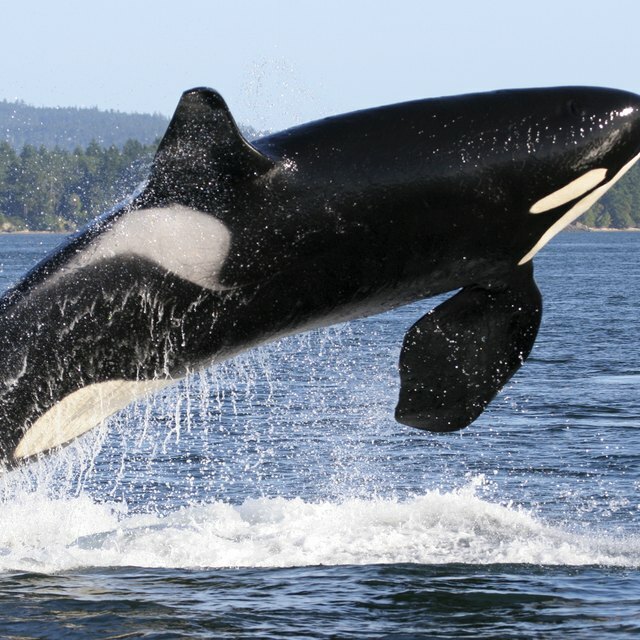 However, these traits also apply to other cetaceans – the group of marine mammals that includes dolphins. Other cetaceans include whales and porpoises, and because the sizes and behaviors of cetaceans varies, even between dolphins, distinguishing one group from another has been difficult. One of the biggest reasons for the confusion between cetaceans lies in the classification of these marine animals: A large number of cetaceans fall under the suborder odontoceti, which is a Latin word meaning "toothed whale." Mammals that fall under this classification have blowholes, streamlined bodies, teeth and often beaks – in other words, the physical traits we associate with dolphins also apply to porpoises and certain smaller types of whale. Adding to the problem, for many years "dolphin" and "porpoise" were once considered interchangeable terms. Scientifically, what we refer to as "dolphins" are members of the family delphinidae. These are distinguished from porpoises and whales because they have a single large dorsal fin midway along the back, eat with conical teeth, and live in large groups with complex social structures, primarily in saltwater environments (though exceptions to these rules exist). Approximately 36 dolphin species are known to marine biologists today, but as we learn more about cetaceans these numbers fluctuate. WDC: How many types of dolphin are there? Australian Government Department of the Environment and Energy: Whales, dolphins and porpoises - What's the difference? Flournoy, Blake. "How Many Kinds of Dolphins Are There?" Sciencing, https://sciencing.com/how-many-kinds-dolphins-there-4854391.html. 25 July 2018. What Do Ocean Mantis Shrimp Eat?